Couples enjoy activities together, such as a meal, movies, travel, walks, or visits with friends and family. Couples engage in supportive conversations, sharing their views, daily experiences, and a good laugh at the end of the day. Together they become a strong social unit, developing a unique way of communicating with one another and creating they own history and identity—raising families, developing social relationships, attending social engagements, making a home. Dementia, however, may affect every one of those relationship-building blocks that couples so lovingly cultivate together, often over a lifetime. Alzheimer’s disease and other forms of progressive dementia often have a profound impact on spousal relationships. While one spouse gradually becomes a care receiver and the other a caregiver, the very nature of their bonding ties begins to change. Changes in perception, memory, and attention tend to render many previously enjoyed activities unsuitable to dementia patients. Caregiving spouses will find that they must adapt their own activities in order to accommodate their partners’ ability to participate. Dementia affects communication skills and patients are no longer able to share those private conversation moments in the same way, creating a void for their caregiver partners. Patients may decrease they interest in participating in social activities, distancing themselves from friends and family, even forgetting precious memories of a cherished marital history. A decline in shared activities, loss of a spouse’s emotional support, and the erosion of verbal communications between the couple—taken together, these factors will ultimately impact intimacy. The very nature of the relationship is affected as dementia-related symptoms begin to alter mood, behavior, and ability to conduct personal interactions. Caregiver spouses are also deeply affected by these changes, often reporting feelings of increased loneliness and a longing for having the vanishing relationship back to where it was. Expressions of affection are essential to our well-being, and the need for closeness does not diminish with age or cognitive decline. Dementia patients seek and thrive in closeness, although in different ways than prior to the on-set of dementia. Spouse caregivers, yet again, need to adapt to their loved one’s changes to allow for loving expressions. Difficulties in intimacy for couples affected by dementia are common and can be expected, although it is not possible to predict what specific dementia-related changes any particular patient will experience. Each patient experiences dementia symptoms in unique ways, and each couple will have its unique challenges. Moreover, depending on the progression of the patient’s underlying disease, changes can be fluctuating or temporary, which brings an additional element of unpredictability and insecurity to the relationship. However challenging all of these changes may be, it is important for the health and well-being of both spouses to nurture the relationship, maintain a sense of intimacy, and allow for expressions of love and affection. When communications skills decline, touch becomes an even more powerful means for couples to convey affection. People with dementia need to feel loved, to feel safe, and to feel accepted. Loving touch and affection from their spouses can bring them a lot of comfort and even help lessen some of the negative behavioral and psychological symptoms of dementia. All couples facing dementia will need to find new ways to nurture and promote closeness, and many times the caregiver spouse is the one who bears the greatest share of the responsibility for keeping the relationship alive. This is a recurrent topic in conversations among spouse caregivers, who, in the support groups they attend, often exchange valuable information about coping strategies and how they preserve their relationship throughout the progression of dementia. Fundamentally, all methods of enhancing communication between spouses can potentially help promote intimacy and preserve the relationship. 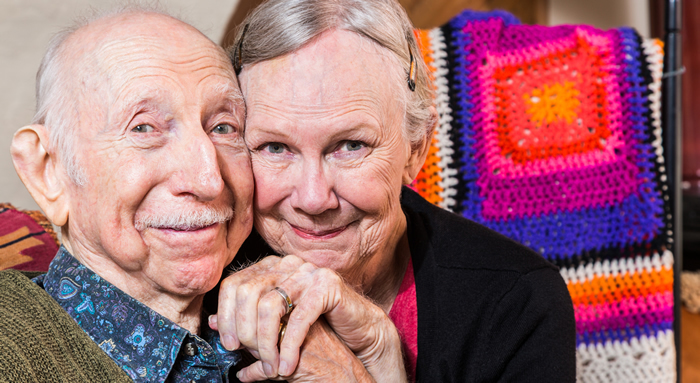 There are a variety of programs and workshops available for couples affected with dementia, designed with the purpose of increasing communications and togetherness. Programs that stimulate communication between spouses through shared artistic expression, including visual arts, musical, and body work, are particularly beneficial. Some dementia-related symptoms that may be affecting the relationship can be addressed and alleviated with appropriate medical therapy. Spouse caregivers should be encouraged to discuss relationship challenges with the doctor and seek possible treatment options. Although caregivers will never be able to restore a relationship to what it was before, there is much that can be done to help nurture the relationship and keep both partners emotionally fulfilled and supported. Relationships are complex and multifaceted, and very vulnerable to changes in each partner. Caregivers must keep in mind that although dementia takes much from their loved ones, there is still much left in them. Ways of expressing love may change, but love remains intact. And each moment may bring a new and precious way to honor and express it. Understanding dementia and making room for loving moments to flourish may well be the key to a successful marriage and a successful partnership in dementia. Nice Luciana, thanks. I would like to share with my support group. Is this OK?